Is your dog plagued by itching and scratching? Does your pup constantly lick and bite their rear end, paws, or tail? Welcome to the world of hard-to-diagnose, hard-to-treat canine skin problems. Itchy skin is often caused by allergies. It’s just as often caused by dandruff, dry skin, fleas, mites, or parasites. 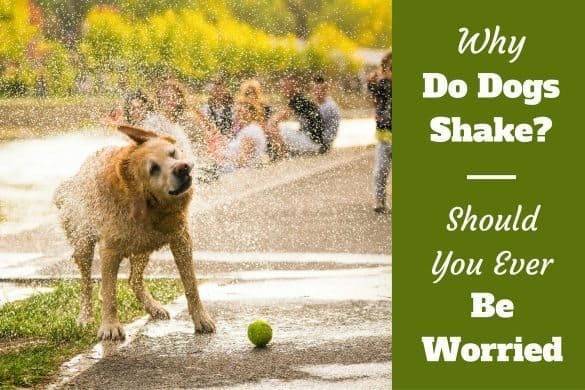 You’ve probably landed on this article because your dog’s skin allergies are making you a little crazy and you don’t know what to do about it, so let’s jump right in and see if we can make things better for you and your dog. 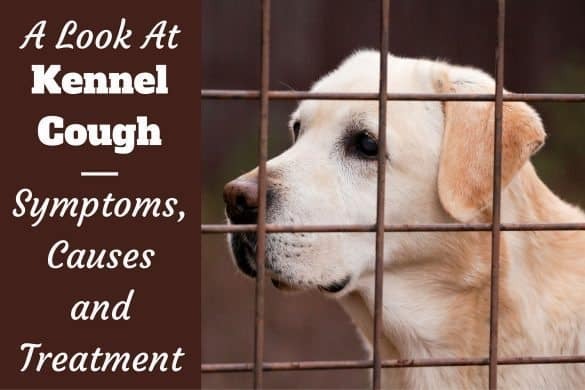 What Causes Skin Problems in Dogs? How Does an Allergic Reaction Work? 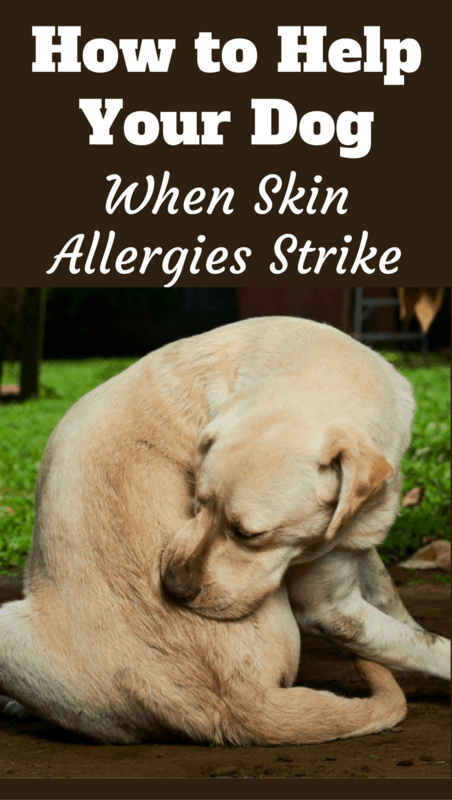 What are the Allergens that Cause Dog Skin Allergies? Your dog is itching and scratching, but that doesn’t always mean they have a skin allergy. In fact, some dogs itch for no reason at all. 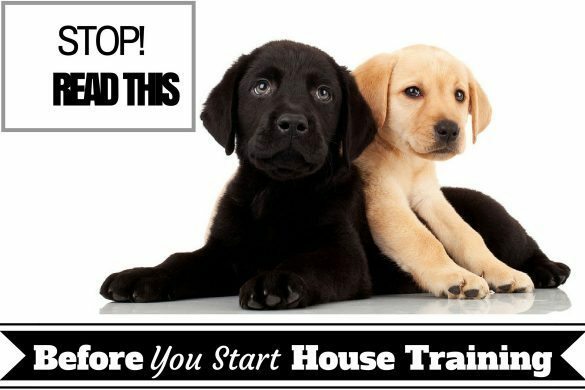 When your dog’s scratching, licking, and biting becomes excessive, though, it’s time to take action. The general term for canine skin disorders is pruritus, which simply means that something is causing your dog to scratch, bite, or lick at their skin to ease discomfort. All kinds of things could be causing your dog’s skin to be itchy and irritated. These are some of the more common causes of pruritus. Fleas – Flea infestations should be ruled out before anything else. They are easy to detect and relatively easy to eliminate (in most situations). Fleas will often hide where it is warm and dark, so inspect the area around your dog’s collar, armpits, and the groin. You can also use a flea comb to hunt for flea eggs, which look like small bits of dirt in your dog’s fur. If you do find signs of fleas, take steps to get rid of them before you do anything else. Mites – Like fleas, mites live in your dog’s coat and have the potential to wreak havoc on the skin. Cheyletiella mite infestations are often called “walking dandruff” because unless you are looking under a magnifying glass, it looks like you’re dealing with a case of severe dandruff. Cheyletiella mites are transferrable to other dogs, cats, and humans, but can be eradicated with several applications of a pyrethrin shampoo. The Sarcoptic mite is an altogether different beast, causing what is commonly referred to as scabies or red mange. Mange is often misdiagnosed because the mites live and feed underneath your dog’s skin. Dry Skin – Dry skin in dogs is another common skin condition, especially if you live in an area with low humidity. Dry skin is also very easy to detect and treat. This condition is characterized by cracked, tough skin, flakes of dandruff in the fur, and skin that is very sensitive to the touch. Dry skin can be caused by environmental factors, and also by a diet of cheap, commercial dog food, which does not often provide the essential oil and nutrients that contribute to healthy skin. It is crucial to feed your dog a high-quality dog food to prevent dry skin and maintain a lustrous coat. 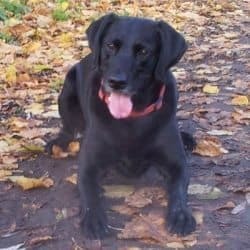 Skin Infections – Dogs who spend a lot of time outdoors, like Labradors, are susceptible to pyoderma, which is a cut, scrape, or another wound that becomes infected. To make things more complicated, dogs who have allergies are more susceptible to bacterial infections. Veterinary treatment for pyoderma includes antibiotics and topical creams. Allergies – The above skin disorders are usually ruled out before tackling the possibility of allergies because allergies are so hard to diagnose and treat. Once a diagnosis of allergic dermatitis is made, you can begin working toward discovering the cause and the treatment for the allergic reaction. Your dog’s body considers an allergen to be a foreign invader. When your dog is exposed to this invader, their immune system begins producing antibodies to protect them. These antibodies remain in the system. Like little guard dogs, they are always on the lookout for the presence of the foreign allergen. When the antibodies alert the immune system to the presence of an allergen, your dog’s immune system will kick into overdrive, releasing histamines, which will initiate an inflammatory response. It’s the inflammation that causes your dog to itch and scratch, which in turn causes wounds, hair loss, and more itching. While all this is triggered by the initial allergen, it becomes a never-ending cycle of inflammation, scratching, and discomfort for your dog. This is the million-dollar question — one that has been researched and studied for years. The truth is that just about anything can trigger an allergic reaction in dogs – dust, grass, food ingredients and preservatives, medications, bacteria, mold, pollen. All of these things (and many more) can be culprits. Your veterinarian can test to see whether your dog has atopy, which is caused by allergens present in the environment that are either inhaled or come into contact with your dog’s skin. Allergy tests will help identify specific allergens that might be causing your dog to scratch. Allergy tests are not generally performed to test for food allergies. Your veterinarian will generally choose either intradermal skin testing or serum allergy testing to figure out what your dog is allergic to. Intradermal skin testing is most often performed by a veterinary dermatologist, who will inject small amounts of common allergens into your dog’s skin to trigger a response. Your dog will only show a reaction to things they are allergic to, and the severity of the response will correlate to the severity of their “real life” allergic response at home. Serum allergy testing is performed in a laboratory using a blood sample from your dog. It will also identify allergens and the severity of the reaction. If you think that your dog may be allergic or sensitive to a food ingredient, the best way to find the culprit is with an elimination diet. Commercial pet foods have hundreds of ingredients, so it can be tricky to find the one allergen in the mix.  Of course, there are common culprits, which will help take out some of the guesswork. The elimination diet consists of a trial period in which you expose your pet to foods one at a time to rule out possible allergens. You should begin with foods that are considered “hypoallergenic,” which means they aren’t widely known to cause sensitivities. Feed your dog a couple of ingredients at a time for a week, making a note of what they’re eating and any reactions that occur. You don’t have to use dog food for the elimination diet. In fact, it will probably be easier if you prepare fresh ingredients from scratch so no artificial preservatives are introduced. Note: Just because a source of food is considered hypoallergenic does not rule out the possibility that it will cause an allergy in your dog. Dogs all have their unique immune systems, and hypoallergenic ingredients are just a starting point. Week One: Cooked ground bison mixed with mashed sweet potatoes. Week Two: If itching persists, switch out the bison for cooked ground turkey. If the itching subsides or stops, you can add these two ingredients to your “safe” list. Week Three: If itching persists, switch out the turkey for cooked white fish. You can also swap out the sweet potatoes for millet. Week Four: Continue to change ingredients one at a time, adding foods to the “safe” list if the itching goes away. At this point, you can also add in some cooked greens like kale, broccoli, or spinach. Be sure to note any sensitivities to new foods as you introduce them. Hypoallergenic commercial dog foods will use ingredients that don’t commonly cause allergies in dogs. High-quality hypoallergenic foods will also have fewer ingredients, making it easier to find potential allergens. Here’s an article about our favorite hypoallergenic commercial dog foods. When you choose a commercial dog food, be sure to feed your dog ONLY that food for a full week. You must make sure that they don’t get table scraps, biscuits, or other treats in order for the diet to be successful. Make note of your dog’s reactions each day, and whether the itching worsens or subsides. 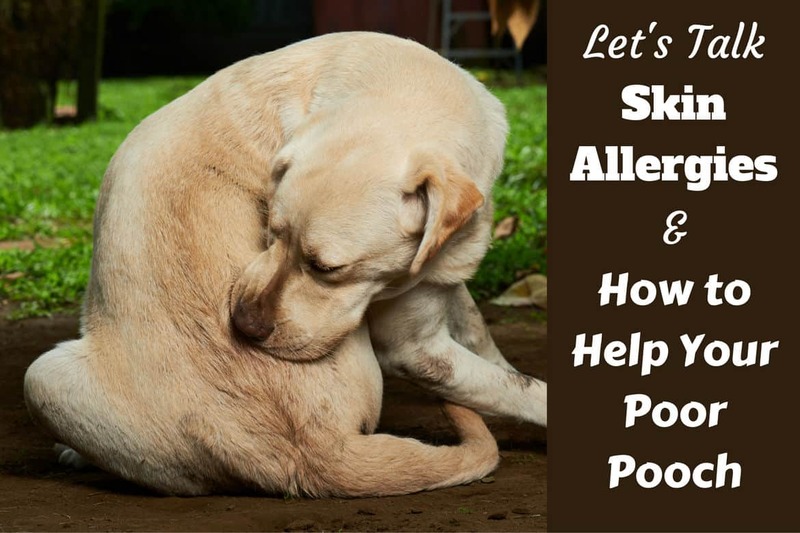 If your dog’s skin problems don’t go away, make a list of all the ingredients and add them to a “potential allergen” list before switching to another brand of food. If your dog’s itching disappears, you can add the ingredients to your dog’s “safe” list. Of course, if you find a commercial food that eliminates your dog’s itching, you can consider the problem solved and switch your dog’s diet. Short of totally eliminating the allergen from your dog’s environment or diet, there’s no cure for allergies. Whether or not you’ve figured out the cause of your dog’s discomfort, you can take steps to alleviate the problem. 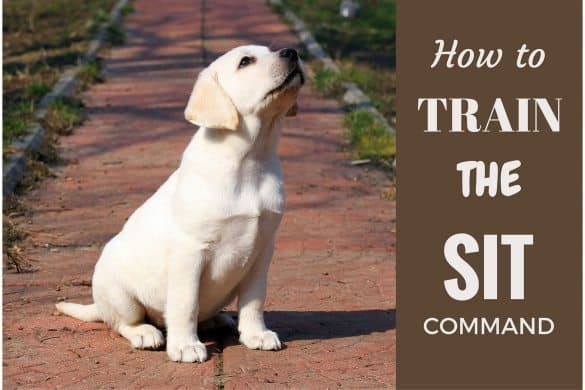 From simple lifestyle changes to complex medical treatments, here are some tips for treating and soothing your dog’s itchy skin. Give your dog digestive enzymes – You can add digestive enzymes to your dog’s food to help with the absorption of nutrients. This will help strengthen your dog’s digestive tract and allow it to absorb fluids more easily, contributing to increased moisture levels in the skin. Try antihistamines – Antihistamines, like Benadryl, can alleviate allergic reactions in some situations. If you decide to try Benadryl, be aware that there are some mild side effects. Always follow the recommendation of your veterinarian. 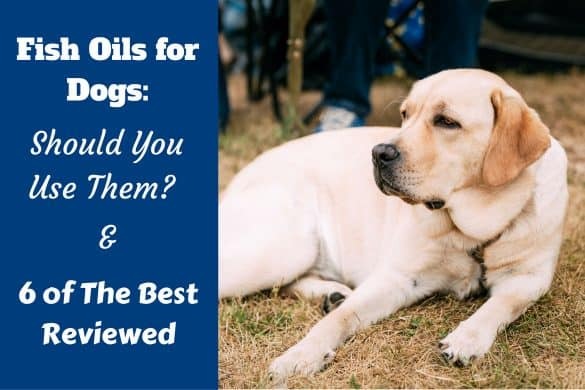 We covered the pros and cons of giving your dog Benadryl in this article. Feed a high-quality commercial dog food. Launder your dog’s bedding weekly – This will help prevent parasites, along with the build-up of dander. Immunotherapy – This treatment works well for dogs who are allergic to inhalants or antigens that come into contact with the skin. It must be used in conjunction with intradermal skin testing. Once the allergens have been confirmed, your veterinary dermatologist can desensitize your dog to the allergen by injecting an altered, weekend version into the skin. It’s a time-consuming treatment. Shots are usually administered weekly over the course of several months. The success rate, however, is as high as 80%. Cyclosporine – This medication can be used successfully for seasonal allergies or other types of atopy. Steroids – Steroids will help relieve extreme itching and inflammation, but they do have short and long-term side effects. They should be used sparingly and reserved for very serious conditions. Oclacitinib – This is a relatively new treatment that shows promise for treating allergic reactions to fleas, food, and environmental allergies. 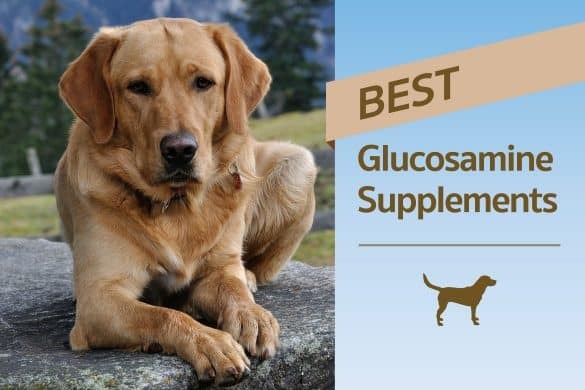 It works by reducing the production of cytokines in the dog’s immune system. Cytokines help cells communicate with each other and promote itching and inflammation in dogs who have allergies. Read more about Oclacitinib on Pet MD. If you want to avoid pharmaceuticals or are treating a dog with minor skin problems, you can try some of these natural remedies to ease your dog’s discomfort. Vitamin E – If your dog has small problem spots, you can open up a vitamin E capsule and massage it into the skin. This will moisturize, alleviate some of the itching, and help prevent infection. Aloe Vera – This plant is commonly used to soothe sunburn in humans, but it is just as useful when treating skin conditions in dogs. If you have an aloe vera plant, simply cut off a leaf and squeeze out the gel to rub on your dog’s dry skin. If you buy commercial aloe vera, be sure that aloe vera is the first ingredient, and stay away from harsh chemicals. Calendula Tea Compresses – Calendula flowers have been used to treat skin conditions for centuries. Steep the dried flowers in hot water to make a strong tea. Apply the cooled tea directly to problem areas using a washcloth. You can also by calendula salves and sprays commercially. Epsom Salt Soak – This is helpful for paws that are red and raw. Fill a tub with warm water and a few tablespoons of Epsom salt. Have your dog stand in the water for soothing relief. Coconut Oil – Adding a bit of coconut oil to your dog’s food will keep their coat soft and supple. Diagnosing and treating dog skin allergies is a complex and difficult task, but with patience and perseverance, it will be a life changer for your dog. Once you know what’s causing the problem, treating skin problems becomes much easier. No matter what is causing your dog’s itching, scratching, licking, and biting, you can treat painful skin problems. Take steps today to heal your dog by working closely with your dog’s veterinarian and promoting optimal health with lifestyle changes and natural treatments. Your dog will thank you. Thank you for the comprehensive article. I would also suggest to add more information on nutrition and diet. Dry to get a shampoo for sensitive skin and change your pup’s diet. Try giving him chicken and rice with mashed pumpkin and carrots as a start. Try filtering your dogs’ water. We had tried everything regarding food for our lab and nothing really eased his itching and allergies and his ears would get really messed up. Once we started filtering his water, his allergies and itching really decreased. From personal experience, 90% of canine skin allergies improved by feeding RAW meat and vegetables – and nothing else. Cooking meat changes its chemistry – where in the wild does the wolf wait for the cave man to cook its kill? ALL grains and kibble are unacceptable. Look at a dogs’ back teeth: they are sharp and pointed for tearing flesh off prey not flat and rounded for grinding grain like a horse. You should also filter your dog’s water. We found with our lab, that helps tremendously with his itching and allergies. Oh and we also gave our lab vitamin E capsules and that helped a lot too. He wold eat them willingly – we never had to hide them in his food!